Student - a person who has or intends on enrolling in your programs. You may need to collect AVETMISS data and will need to keep track of their enrolments, outcomes and payments. Tutor - these are the people that facilitate your classes, supervise assessments or assist your instructors. You may want to enter their resume or bio details to display on your website. You want to know what classes they have been scheduled to deliver and what payments you have made to them. A tutor can also be a student. If a tutor has an employed end date in the past and is no longer active, then they will be greyed out in the contact list view. Company - a business that you may need to invoice, who may book their staff into your classes, or you may work with in partnership to deliver classes. Tutors can also be companies. Contacts can be related to each other, e.g. employer and employee, friends, siblings, spouse, child or parent. Open the contact window and select the plus (+) button. This will create a new record. Enter the contact's name and contact details e.g. address, phone numbers and email. When you look up a student name during the enrolment process, and the name can not be found (the student is not an existing student) you are given the option to select 'New' from the drop down list. Selecting new begins the process of creating a new contact record, as part of the enrolment process. Just like creating a new contact from the list view, you have the opportunity here to collect all the contact details, answer the AVETMISS questions and set their marketing contact preferences. By default, all new contacts created during the Quick Enrol process are set to be 'students'. You can also add the tutor option to the contact record where relevant. Please note that if you do not complete the enrolment process and save the record, the new student you were creating will not be saved either. In the contact record, or when you are processing an enrolment, you can make changes to any of the details you have previously collected. Just type the new information into the field. Students and Tutors can also update their personal contact details via the Web Portal This saves them having to contact you if they move or change their phone numbers. If an existing contact changes their relationship with your college, for example, a past student becomes a tutor, there is no need to create a separate record - simply modify their current record and add in the additional information. When creating a new contact or amending an existing one, you can also set the preferences for whether or not the contact wishes to receive marketing communications via email, SMS or via the post. You are also able to flag a contact method as (undeliverable). You will note within the Generaltab of the contact record, each method of contact has a cogwheel icon to the left of the entry field. In the following example, the operator can set the preferences as to whether the student wishes to accept marketing material. If there is a contact method (post, SMS or email) showing with no additional information labels underneath the contact field, this means that the client has opted in to receive marketing material. If a contact method is not able to send an email, SMS or postal item, you can flag the contact method as (undeliverable). This is also managed via the cog wheel function as shown in the following example. If a client nominates to opt out of receiving marketing material, this does not preclude them from receiving the automatically generated enrolment confirmation and tax invoice emails and SMS messages. Contacts who are marked as students have a tab labelled VET. On this tab, you can record the answers to the standard AVETMISS student questions regarding their country of birth, prior educational achievement and other required detail. For customers using an onCourse website to take enrolments, these questions are asked of the student at the time of enrolment. Only valid answers can be entered into these fields, with most fields referencing look up data such as the ABS list of countries and languages, or the approved list of AVETMISS responses. For Victorian and Queensland customers, the field to record the student number is also located on the VET tab. For CRICOS providers, additional fields are available to record the students passport, visa and health care details. This information is not reported as part of the AVETMISS standard. Additional information, like the CRICOS student's next of kin, emergency contact or homestay provider can be captured using the contacts relationships feature. Under the AVETMISS 6.1 requirements, a response to most of these questions is optional, so if your students decline to provide information for one or more of these fields, we will automatically export the approved 'did not respond' code for that question, and also ensure that validation errors, like students speaking English as their first language and reporting themselves as speaking it well, are not exported from onCourse to cause problems with your funding providers. Please note that some student related AVETMISS questions are also located in their enrolment record, where the response is particular to that enrolment event e.g. their traineeship approval number or reason for study response. The history of a students enrolments, outcomes and certifications is available in the contact Education tab. 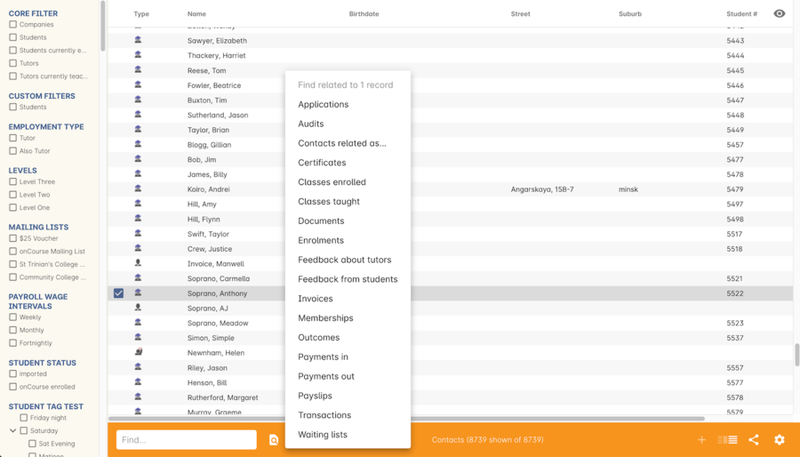 The first list component shows all the classes the student has been enrolled in. Some of these classes may have finished, so the enrolment status will show as 'complete'. 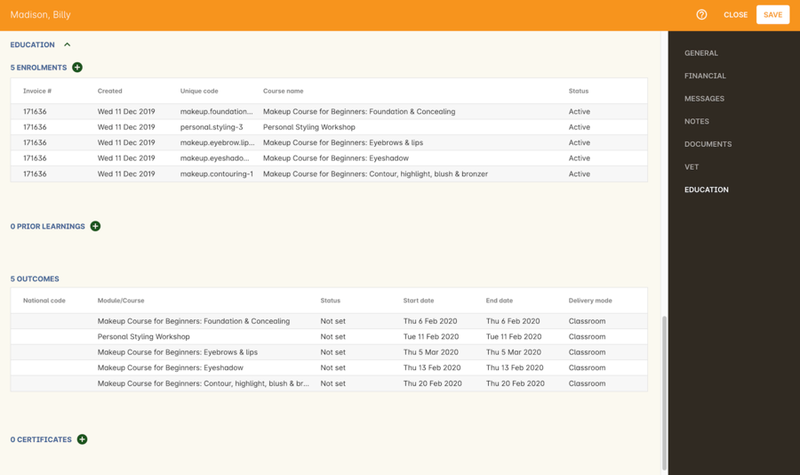 Classes which haven't started or are in progress show the status of 'active'. If you click on the '+' symbol at the top right side of this list then this will pre-populate Quick Enrol with the students contact data. When a student's enrolment has been cancelled and/or credited, the enrolment status will show cancelled or credited. A complete enrolment history is retained for each student, including classes they have withdrawn from, so you will always have a full picture of their engagement with your college. Enrolments can not be deleted, but they can be cancelled, a credit note created, and that credit applied towards a new enrolment. The second list component shows a list of any prior learnings. The third list component shows the outcomes for all the units linked to all the student's enrolments. For non-VET enrolments, these will include non-assessable outcomes for their enrolments. You do not need to set anything for these enrolments, even if reporting them via AVETMISS, as an outcomes status of 81 is always exported for unset statuses in these types of outcomes. VET outcomes will show the national code and unit details and you can double click on this outcome to make changes or update the status. The final list component of the enrolment record shows all the certificates (both Statements of Attainment and Qualifications) issued to the student. Unprinted certificates can be edited by double clicking on them, printed certificates can be revoked, but not edited. You can print certificates from the certificate table only. When a contact is invoiced, or makes a payment, an entry is made in the contact's financial records. This is visible on the contact Financial tab. Often, a student is invoiced and pays for their own enrolment. When this occurs, you will see the financial data on the student's Financial tab. When the enrolment is paid for by another person (often termed a 3rd party payment) the financial data will be on the payer's Financial tab, and not the student's. All the financial transactions are shown in creation date order, with a running total that shows the contacts balance at any point in time. Invoices, credit notes, payments in and payments out, will all show on the Financial tab. You will also note from the following example that each payment line of the financial tab will identify if it was an incoming or outgoing payment. E.g. 'Credit card payment in (office)' reflects a payment in. On the financial tab you also have the ability to set some financial defaults that define settings when the conact is invoiced. Invoice terms days: This will be show the system default as defined in your financial preferences, but can be unlocked and set to a value specific to this contact. For example, your default may be 7 days but some contacts may have 30 day custom terms. Tax (override): By default, all contacts will be charged the tax rate set for the product or class. However, some contacts may reside overseas and may not be liabile to pay local taxes like GST. In this case, you can choose to override to N for no GST to be applied to any invoice line created for an invoice joined to this contact. Not this does not affect invoices created in the past - only invoices created after this setting is applied. All types of documents can be added to the contact record, such a copies of completed assessment actvities, permission forms and signed declarations for funding agreements. The onCourse document management system will store and version control these records. Special needs information can also be added to the student contact record on the document tab. These special needs could be additional information a tutor needs to know as part of the the course delivery, such as the student needing access to a hearing loop, or information for dietary preferences and catering. The special needs field can be enabled in the onCourse CMS as one of the questions asked during the online enrolment process. Each time a student enrols they have the opportunity to provide information. It will be appended with the date of enrolment. For example, 7/1/14 - Vegetarian 8/1/15 - I have a broken foot and need a chair to keep it elevated. Student special needs can be printed to provided to a class tutor or coordinator via the class print menu, selecting the 'Student special need report'. Each contact (student, tutor or company) can have an identifying image attached to their record that is visible as part of their general information. To add an image, open a contact record and click on the image place holder. Select the image from your computer that you would like to use and press ok.
Gravatar images will automatically load for contact records if the user has a avatar linked to their email address at https://en.gravatar.com. Gravatar images are overriden with locally uploaded profile photos. To make sure you have a gravatar licence enabled within onCourse go File -> Preferences - > General, and you will see it listed in the Sevices tab (as shown below). These images will also display in the tutor portal on the class roll for student identification purposes. This tab keeps a list of all notes you have relating to the contact. You can add a new note in the 'New note' field at the top of the tab. Below this will show you a list of previous notes created, these fields are not editable. Each of these entries has the date and time it was created, along with which user created it. The tab only appears if the contact is a student. This allows you to see all the enrolments they are currently enrolled in and have been enrolled in the past. If they are enrolled into any VET classes you will see information about the status of the modules and qualifications. 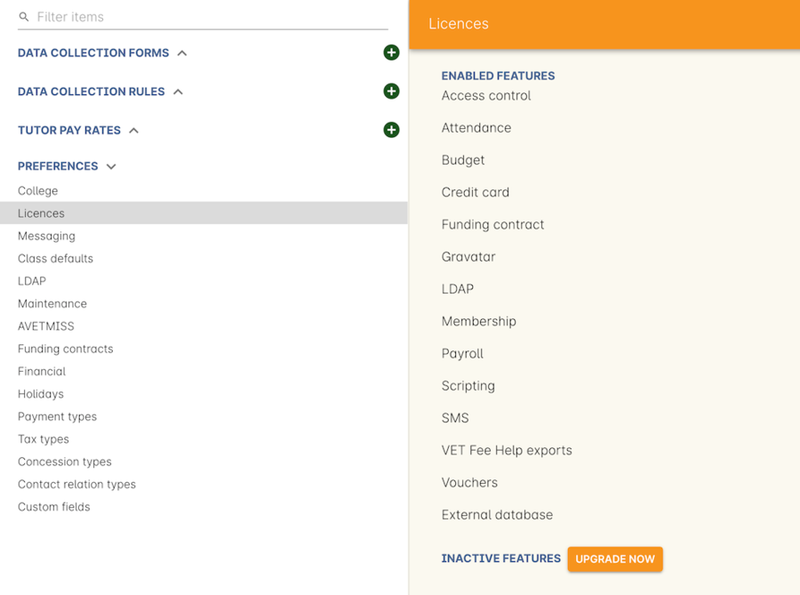 If you have added custom contact fields to your onCourse general preference, you will see an additional tab labelled 'Custom fields' on the contact record. This tab will display all the custom contact fields you have created, and any response the student has provided during the online enrolment process or responses you have manually entered into their record. If you wish to add additional custom fields to your databased, refer to the General Preferences chapter of the handbook. Relationships between contacts can have relationships with other contacts to assist you with billing, contacts and marketing activities. For example, a corporate customer may enrol and pay for their staff members to complete training at your college, employer and student details can be connected for traineeship management, parents contact details can be collected for minors, for billing and emergency contact details, and spouse and friend relationships can be captured for use in marketing campaigns e.g. 20% discount when you refer a friend. In the contact window, you can add a relationship with the plus symbol. This opens a new sheet where you can type in the name of the contact you wish to add and define the relationship type. You can also define relationships through theQuick Enrol process, so that if the enrolment process connects two existing, but unrelated contacts, you can add the new information. When you add a second or subsequent contact to an enrolment, it will ask you how they are related to the first contact, or payer. 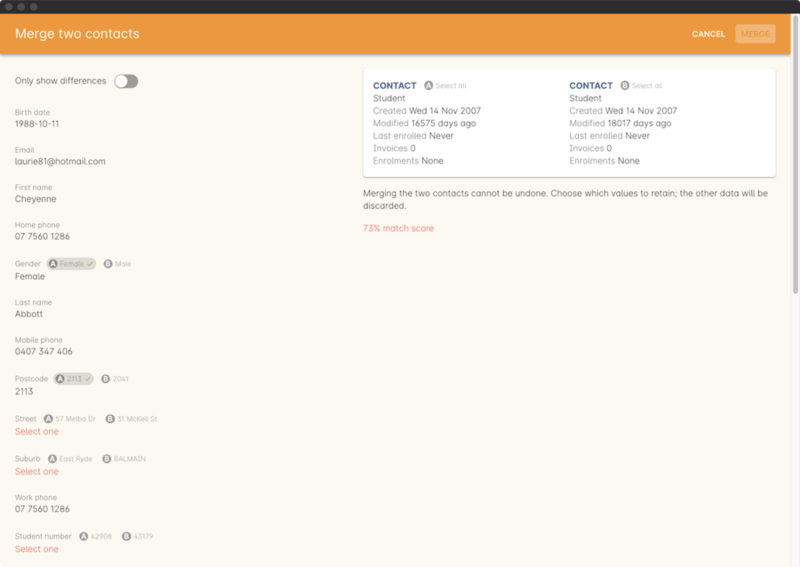 All contacts can have multiple types of relationships with many other contacts. Relationships can also be deleted as needed, using the minus button in the contact window. To add a type of relationship between contacts, while in onCourse go to File > Preferences > Contact Relation Types. Here you can create different types of relationship like; Parent to Child. 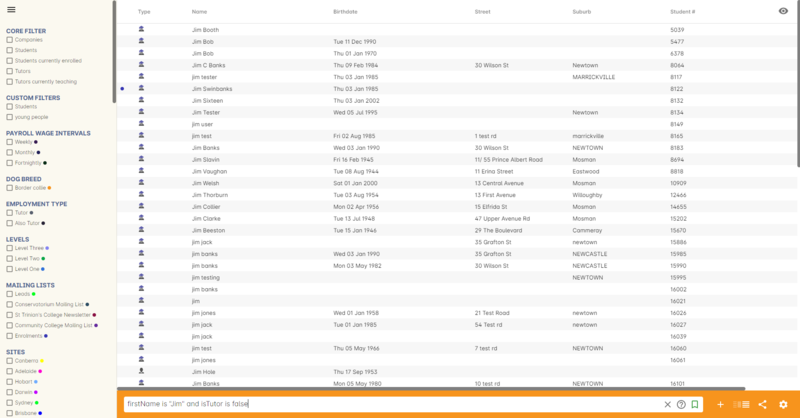 If you are in the contact window and want to find someone with a relationship to the contact currently highlighted, simply click on the cog wheel icon (top right hand side) and select "Find records related to x selected contacts" where "x" represents the amount of contacts highlighted. This will open a new contact window showing the results. You can find either all records related to a contact via any relationship, or via a specific relationship type. For example, you could find all the students enrolled in 'Craft for Kids' and then find all the contacts related to them as parents. When relationships have been defined within contacts, they can be used to build enrolments quickly. 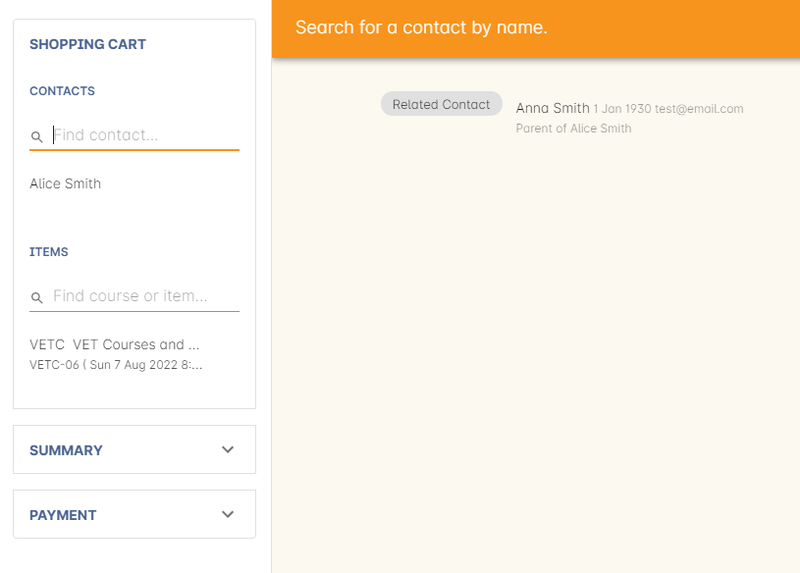 When a contact is added to quick enrol, the people they have relationships are shown if you click on 'CONTACTS' and will appear on the top right hand side of the page. You can add these contacts to the same enrolment by clicking on them. There are multiple ways you can search for contacts in the onCourse database. The simplest method is to open the contact window and begin typing the contact's last name in to the quick search window. This will find matching contacts based on the text you have entered. The filters and tag groups in the left hand side of the window are also a quick way to find contacts. For example, if you have the core filter 'students currently enrolled' ticked, and select a subject tag, like 'computers' you will see a list of results returned showing all the students who are currently enrolled in a class for a course tagged with a computer tag. You will see that some tag groups appear multiple times in the window, for example the subject tags (for students enrolled) and the subjects tag (for tutors teaching). You can use these tags on their own, or combination with other filters and queries to create a powerful range of search options. If you wish to search for contacts based on other criteria, you can open the advanced search window by clicking on the magnifying glass and choose which criteria you wish to search on. You can continue to add criteria to your search options by adding additional lines to the query. You have the ability to search for such things as Age, First name, Last name, Email, Tagged with, Enrolled in, Tutor for, Postcode USI, USI status and much more. When you have an advanced query running, you will see the words 'Advanced find' in the search window. To remove the query results, click on the red x. You can save any search query you run in the Advanced Search box by clicking the cogwheel in the bottom-left corner of the Advanced Search window, then clicking 'Save Find'. Give the search query a name and set its visbility (you can make it visible for you only or for everyone), then click 'Save'. The filter will be available in the same window it was created--i.e, if you create an advanced search in the 'Contacts' window, the filter will only be visible in the Contacts window. 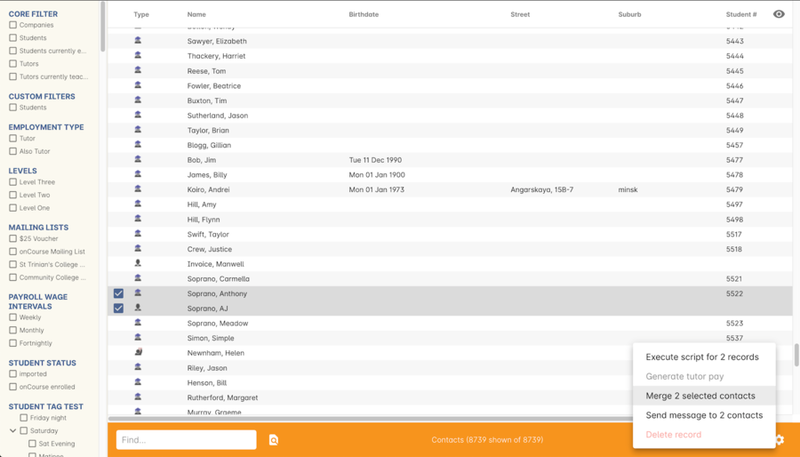 You can also search for information related to contacts by using the find related records icon which is located to the right of the search field. This option can be useful for finding data related to one of more contact e.g. all the invoices for a company, or all the contacts related to a group of contacts with a particular relationship e.g. all the parents of a group of children. As you can define the types of contact relationships you wish to collect, this query can be quite powerful. For example, if you know you regularly deliver training to students with additional needs who are supported by agencies, if you have set up this relationship type and made relationship joins between agencies and clients, you can then find all the agents you worked with recently, and send them information about upcoming courses that may interest their clients. When you run a 'Find related...' search, the results open in a new list window, and you can continue to run searches on that returned list of results to further refine your data. At a glance, for a single contact, be it a tutor, student or company, you can find all their related enrolments, drill down through all their invoices and payments, check the printing or revoked status of each of their certificates or analyse the mailing lists they have subscribed to. For a group of contacts, this search function provides powerful marketing opportunities and the ability to analyse your student base in a variety of ways. On occasion you will find two contacts records in onCourse that belong to the same person. This can happen for a variety of reasons, such as a typo in a name, a change of name between enrolments or via an online enrolment where the returning student uses a different email address. When you notice a potential duplicate, it is easy to compare and merge the records. The merge process allows you to choose the preferred contact details of the student, and then merge together the enrolment, outcome, prior learning and financial history of the two students into a single record. onCourse includes special validation to prevent the merging of contacts who both are enrolled in the same class or have different verified USIs. Otherwise, any two contacts can potentially be merged into one. If you have contacts where you have located records in triplicate, then you will need to merge two of records first, then merge the remaining two records into one final record. To merge to contacts, in the contact list view, single click to highlight both records. Go to the cogwheel option in the top right hand corner and select 'merge 2 selected contacts'. A new merge window will open. In this window differences between the two records will be highlighted. You can choose which data to retain by clicking the arrow and switching between the response in contact 1 and contact 2. onCourse will try and assist with this process by auto selecting the 'better' option, where one record has a response and the other record has a blank response. As you switch between options, you will see the results change in the contact window displayed to the left. If, for example, the address data from contact 1 or contact 2 were both incorrect, you can enter a new address for these merging contacts by typing directly into the contact edit view on the left. Once you have confirmed the data choices for the contact is correct, choose 'Save' to perform the final merge. Please note that there is no undo option. When contacts have been merged, a note will be autopopulated into their record saying 'Merged student (student number) by onCourse (user name) on Tue 1 Sep 2015 12:08pm'. You can search contact notes for the words 'merged' or a specific student number if you need to find a contact who has been merged.